April 22, 2015, 11:29 a.m. It wants to be a “real-time magazine” on the web, connected to its print heritage. But stripping out the visual noise won’t please everyone. 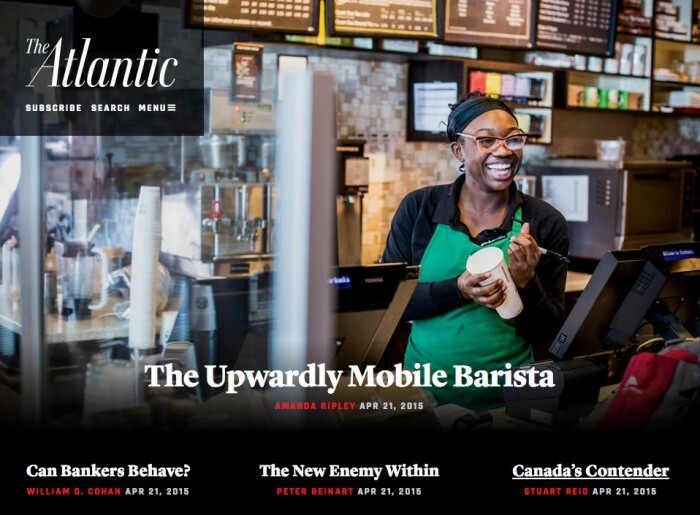 By Joshua Benton @jbenton April 22, 2015, 11:29 a.m.
What if we described TheAtlantic.com as a direct, dynamic, digital extension of our core identity in journalism — as a real-time magazine? We created a site that makes a new priority of visual presentation, that offers a cleaner reading experience across digital devices, and that gives us the flexibility we need, both in our articles and on our homepage, to join the speed and urgency of the web with the noise-cutting and impact that have always been central to The Atlantic’s ambitions. The new homepage is composed of full-width modules each representing either one big story or a constellation of connected stories. We can move these modules up or down the page, allowing us, among other freedoms, alternately to lead with the urgency of our news coverage or the impact of a big feature, according to the needs of the moment. It also allows us to give full play to the same urgency and impact below the top of the page. As you return to the site, you’ll find different homepage modules in different orders with different kinds of stories in different combinations. What you won’t find, we hope, is the impression of diminishing importance as you scroll down. One downside of all those big photos: They make for a heavy page. The homepage was 8.7 MB for me this morning on desktop and took 5 seconds to fully load on a fast connection — though DOMContentLoaded fired in about 2.
.@sullivanamy @TheAtlantic Totally gorgeous and I like it — but am I alone in feeling like the site has so much less content now? All that said — while decreased newsiness might not be appealing to news nerds like me, it strikes me as a very reasonable business choice. (See also The Wire.) While The Atlantic’s traffic is still growing, run-of-the-mill online advertising faces as uncertain a future as ever, and a redesign that classes up the joint would fit with a continued push upmarket. (The Atlantic describes its online audience as INFLUENTIAL, CONNECTED, AFFLUENT, and EDUCATED.) The Atlantic is never going to win a scale war with the BuzzFeeds of the world, so doubling down on an appealing core demographic — and looking a little less Huffington Post — makes sense. — What’s this site about? News? Analysis? Service? Gossip? — What’s the sensibility? Serious? Playful? Quirky? Geeky? — What are the subject areas that matter most to its editors? Washington? Wall Street? Hollywood? Silicon Valley? For these reasons, the homepage is, as the marketing team would put it, the ultimate brand statement. There’s one thing, though, that the homepage is not much good for: driving traffic. While I don’t have data on this, it’s my sense, anecdotally, that many editors continue to believe that one of the primary goals of the homepage is to guide readers to the articles on the site. I know that’s what I long believed. But the evidence — and here there is data — suggests the homepage is overvalued as a mechanism for generating visits to interior pages. Across The Atlantic sites, the fraction of visits that begin on the homepage is surprisingly small. About 13 percent of visits to our flagship TheAtlantic.com start on the homepage. That figure is about 8 percent for The Atlantic Wire and 10 percent for The Atlantic Cities. That means, of course, that roughly 9 in 10 sessions begin on an article page or, much less frequently, a channel or author landing page. For many modern media sites, the homepage is as much a brand showcase as anything else. The Atlantic’s old one looked like 50 pounds of modules stuffed into an 8-pound sack; it looked low-rent. The new one does a much better job of communicating a brand identity in that 10-second glance — The Atlantic is thoughtful, beautiful, and high-end. Sure, that may make The Atlantic seem less newsy to folks like me or those commenters above. But it also seems like a tradeoff that probably makes sense to make. POSTED April 22, 2015, 11:29 a.m.
Benton, Joshua. "The Atlantic redesigns, trading clutter and density for refinement." Nieman Journalism Lab. Nieman Foundation for Journalism at Harvard, 22 Apr. 2015. Web. 19 Apr. 2019. Benton, Joshua. "The Atlantic redesigns, trading clutter and density for refinement." Nieman Journalism Lab. Last modified April 22, 2015. Accessed April 19, 2019. https://www.niemanlab.org/2015/04/the-atlantic-redesigns-trading-clutter-and-density-for-refinement/.